I’ve grown coarse CaWO4 (scheelite) in Na2WO4 flux roughly following the procedure of Oishi and Hirao (1990, attached) and starting with powdered CaWO4 (5.46 g) and Na2WO4·2H2O (30.5 g). Although Oishi and Hirao used Pt crucibles, I performed the synthesis in an alumina crucible (50 mL) and observed no obvious interaction between the crucible and its contents. I also started at lower temperature (~970ºC) and allowed the melt to soak for about nine hours prior to ramping the temperature downward. I cooled the mixture from ~970ºC to ~550ºC in 5ºC/hour increments with overnight soaks. According to the solubility data presented by Oishi and Hirao, crystals probably did not begin to nucleate until the temperature had reached about 830ºC, and so I probably could have increased the amount of solute quite a bit. The manual temperature adjustments required a total of 90 trips upstairs to the furnace room, and so this has finally convinced me to construct a ramp-and-soak temperature control unit to override the furnace temperature control. I hope to have it in service in a few weeks. 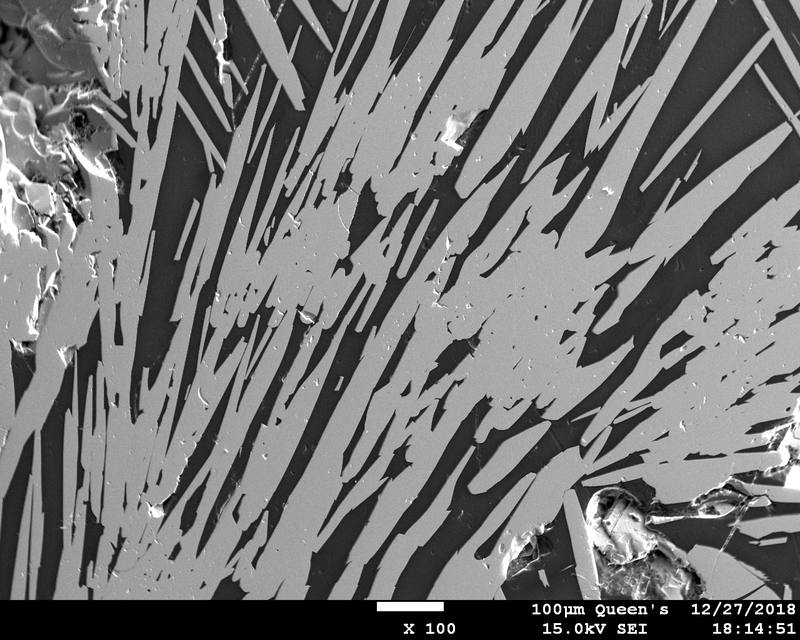 The run produced a wide range of crystal sizes, with many in the 1-2 mm range and some as coarse as ~4 mm. The point group symmetry is 4/m, and tetragonal dipyramids and pinacoids are easily visible. Melt inclusions are visible in some of the crystals, though most crystals are quite clear. In the photo below, the width of the field of view is roughly 35 mm. I haven’t mounted any of the material yet, as I’d like first to grow PbWO4 (stolzite), CaMoO4 (powellite), and PbMoO4 (wulfenite) and place them all in a single mount. I’ve now connected my temperature controller assembly directly to the heating elements of an old Gallenkamp muffle furnace after disconnecting its internal circuitry (see photo below). The black, rectangular box next to the wall is a 7.5 kVA autotransformer that I’ve used to bump the AC line voltage up from ~210 V to around 235 V (the meter is reading a little high). Of course my setup is totally CSA approved . (But really I do take safety seriously. The furnace is located in a small, locked room to which only a handful of people have access, and all of them know what I’m up to.) At any rate, since the furnace heating elements are just resistors, the autotransformer allows me to draw more current and provide more power to the furnace. However, the resistance of the heating elements increases with increasing temperature such that power consumption falls from ~3.2 kW at room temperature to ~2.8 kW at 1000ºC. Still, it’s now much easier for me to get to ~1000ºC relatively quickly. One thing I didn’t think about ahead of time is that the furnace is large enough that its thermal response to an input of energy is so exceedingly slow that this makes the controller error amplifiers very difficult to tune appropriately; this can make the cooling ramp rate difficult to set precisely. I’ve worked out a design for an analog controller that I’m planning to construct this fall, and this will allow me to explore different methods of temperature control; I'll be able to add in a single ramp through slow charge/discharge of a film capacitor. 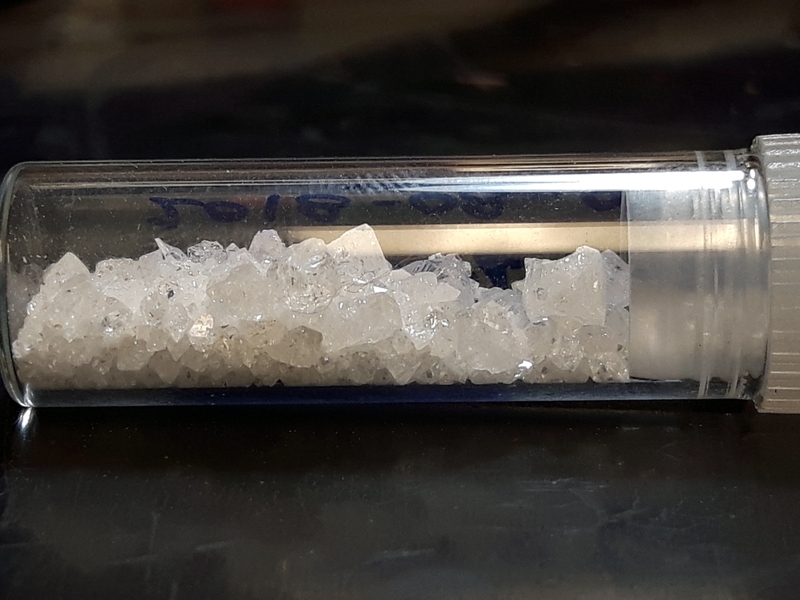 In my first fully automated run, I’ve synthesized coarsely crystalline CaMoO4 (powellite) in LiCl flux, with resulting crystals ranging in size to ~4 mm. In the attached reference, the authors describe using CaMoO4 powder as a starting material. Instead I used CaCO3 and MoO3 and then allowed these to react during the synthesis run, in which I used a cooling ramp rate of 2.2ºC/hr for about 91 hours after a 24-hour soak at 750ºC. When I removed the crucible from the furnace, I was puzzled to see coarse, scaly, colorless, water-insoluble crystals coating the outside of the covered crucible as well as apparent unreacted CaO powder mixed with the CaMoO4 crystals (low yield) and LiCl inside. Upon doing some additional reading, I found that MoO3, which melts at 795ºC, has a high enough vapor pressure that, even at 750ºC, significant volatilization can be expected. When I grow PbMoO4 (wulfenite), I’ll grow the fine-grained compound by solid-state reaction first and then dissolve and precipitate it from a flux (Na2MoO4?) to get larger crystals. Right now I’m growing PbWO4 (stolzite) in Na2WO4 flux using PbO and WO3 as starting materials, as these should be less subject to volatilization (I guess I’ll see). Before I grow PbMoO4, I plan to do a run to synthesize some more CsNbOB2O5, which I’ll distribute to those who want it. I’ve been continuing to work on synthesizing tungstates and molybdates. Below is a photo of two SrWO4 crystals that I grew in a LiCl-NaCl flux. 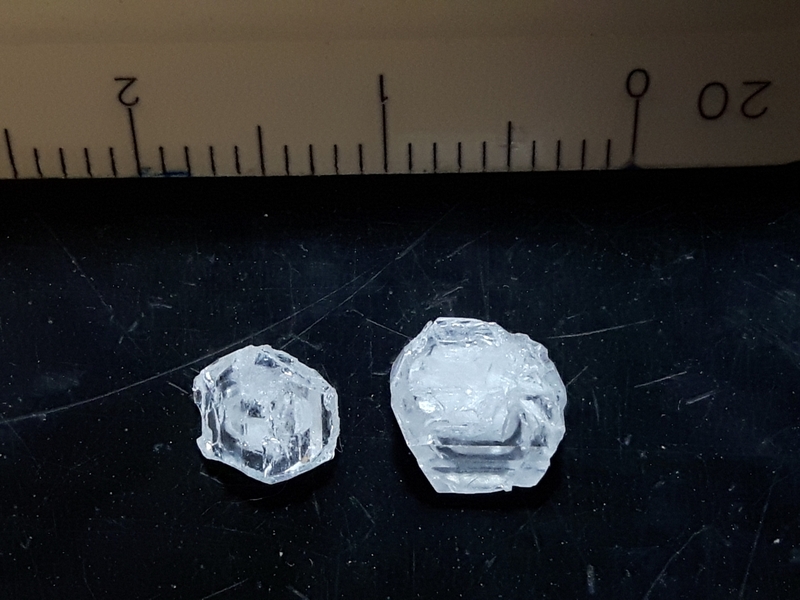 These are two of the largest crystals that I’ve grown so far; the scale has divisions of 1/20 inch, so the larger of the two crystals is about 8 mm across. The interiors appear to contain melt inclusions, but the rims are clear. The form that typifies SrWO4 is the tetragonal dipyramid, but each of these crystals possesses a prominent basal pinacoid. In a quick ED spectrum collected using our SEM, some Ca is apparent and is likely present as an impurity in the SrCl2·6H2O that I used as a starting material. You might be asking why I’m spending time synthesizing tungstates and molybdates from the scheelite group (or maybe you’re not wondering). The reason is simply this: in addition to the fact that they can serve as useful standards, they are relatively easy to grow and so give me an opportunity to practice my synthesis technique. Each of CaWO4, CaMoO4, PbWO4, PbMoO4, and SrWO4 (and I might add in in Bi2WO6 -- russellite) requires temperature no greater than 1000°C and can be synthesized in an alumina crucible; large crystals can be grown in a relatively short period of time (days). Really anybody could grow these even with a very primitive setup. The only difficulty is that PbO, MoO3, and some of the halide fluxes are subject to evaporation and/or sublimation. But then this provides an opportunity for me to learn how to deal with this problem (when I grow PbMoO4 -- wulfenite). This standard synthesis work you are doing is a wonderful gift to our field. Perhaps we can start a "crowd sourcing" for you to get some money for better/more Pt crucibles? I'd kick in $100 right off the bat. Does anyone here have any experience with creating crowd sourced funding for a scientific project like this? Below are the tungstates and molybdates that I’ve synthesized; they’re listed in chronological order. I used the same alumina crucible for all except the last, for which I used a new alumina crucible. I performed full analyses of the synthetic scheelite and powellite, as I have some excellent, essentially end-member natural material from Bourlamaque, Québec and from the Tonopah Divide Mine, Nevada, respectively. For the other materials, I analyzed for Ca only. Note that measurement of Ca Kα in tungstates is difficult when Ca concentration is low, as W Ll(2) interferes at/near the Ca Kα peak position both on PET and LiF; I used LiFH (sin[θ] = 0.834) and operated in differential mode with a relatively narrow window (2.7 V). 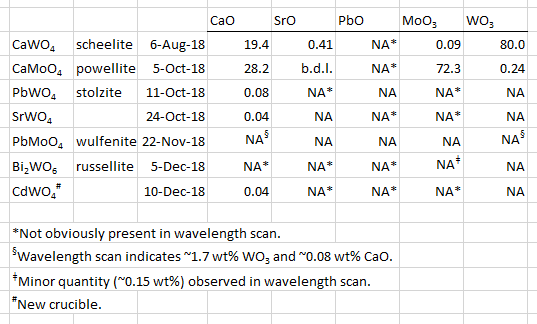 The scheelite appears to be slightly deficient in WO3 compared to the natural material, however the discrepancy is small and could simply be due to a systematic measurement error. The SrO and MoO3 appear to be present in the powdered CaWO4 starting material from Fisher; it's labeled "precipitated pure." I'll plan to grow coarse crystals again and will use CaCO3 and WO3 as starting materials instead. Overall I’m a little disappointed with the results, as I apparently was unable to remove impurities sufficiently from the crucible after each run, even when scrubbing with emery paper. The worst case was the synthetic wulfenite (PbMoO4), which contains substantial WO3 -- I didn’t bother to do quantitative analyses of it. I prepared it in a two-step process in order to combat problems with volatility of both PbO and MoO3: in the first step, I synthesized fine-grained material via solid-state reaction by heating to 1000°C and holding at that temperature for 48 hours. When heated quickly to relatively high temperature, the oxides react quickly enough that little evaporation or sublimation occurs. I then attempted to obtain coarser crystals by dissolving it in Na2MoO4 and then cooling slowly. While I was able to dissolve the PbMoO4 without any problem, it never re-precipitated. However, the grains produced by the solid-state reaction measure up to a few hundred microns across, and so I was able to mount and examine this material without any difficulty. The ever-present contaminant in the runs is CaO. It appears in concentrations of ~400 ppm in the CdWO4, which I prepared in a new crucible. I even saw it in one of my CsTiOAsO4 runs despite starting with a thoroughly cleaned Pt crucible covered with Pt foil. Presumably it is present in the decades-old furnace and begins to mobilize as the temperature is raised. Another problem I encountered was that the Li2B4O7 flux that I used in the synthesis of Bi2WO6 (russellite) reacted readily with the alumina crucible and made it impossible to remove the crystals without breaking the crucible (hence the need for a new crucible for the CdWO4 synthesis). As you can see below, the Bi2WO6 produced some pretty cool textures. The crystals are not acicular, but rather are platy and oriented at high angle to the plane of section. Unfortunately, my Omega digital temperature controller decided to start spitting out an error code that doesn’t seem to make any sense, especially since the “error” occurs only when the temperature is stable. This forced me to press into service an analog controller that I’ve been building and testing over the past few months. 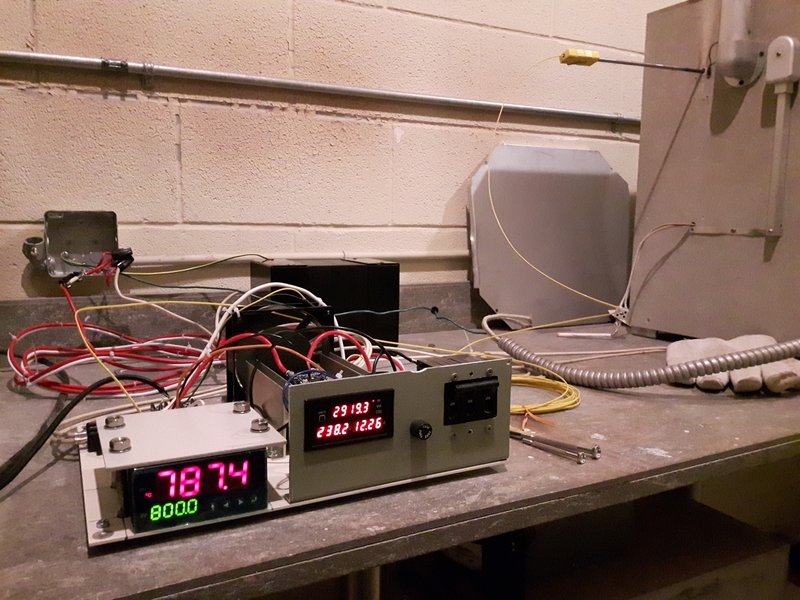 I took the photo below while testing it at 60°C (which gives a reading of ~300 mV) using a hollow, wirewound power resistor as the “furnace,” with the thermocouple probe placed inside the tube. 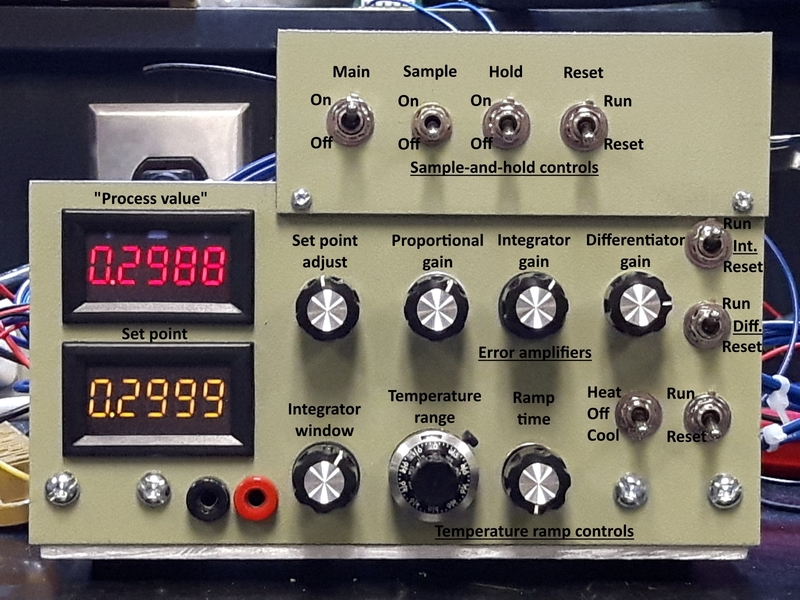 For this relatively responsive “furnace,” I can get the temperature stable to within about 0.2°C with appropriate settings of the error amplifiers. I actually had intended to place this controller in a box, but, as you can see, the control panel managed to outgrow itself. With the much less responsive real furnace, temperature control is a bit of a challenge, and I’m now rebuilding the circuit to address some difficulties that I came across. The temperature ramp is tricky to construct for good performance, as it relies on exceedingly slow charging of a large polypropylene film capacitor as part of an op amp integrator circuit. The op amp that I’m using is the LMC6081, which has an exceedingly low “typical” input bias current of 10 fA. This means that the op amp inputs can’t come in contact with FR-4 circuit board material, as its surface resistance is too low(! ), and wiring needs to be done “dead bug” style in part, with air as the insulator. Further, I’m using universal, breadboard-style prototyping boards, and so component and wiring layout is not optimal overall. The final major problem, possibly related to the former, is that the circuit is oscillating. While the oscillations don’t prevent the circuit from functioning, they are certainly affecting the signal sent to the solid state relay and likely sapping power output. This sort of problem can be really horrendous to deal with, but I’ll have to dive into it soon.